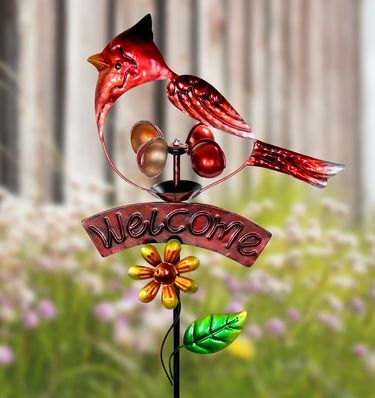 A Red Cardinal Spinning Garden Stake makes a cheerful welcome sign for your home or garden. With beautifully hand painted details this garden art will spin in the breeze adding color and life anywhere you place it. Made of durable metal and UV treated to resist fadind in the sun. This kinetic wind powered welcome sign is simple and sweet garden fun. Size: 11" x 3.5" x 36" H.